Be the first to share your favorite memory, photo or story of Wallace . This memorial page is dedicated for family, friends and future generations to celebrate the life of their loved one. Funeral services for Wallace Wayne Haymon will be held at 2:00 p.m. on Saturday, January 26, 2019, at First Baptist Church of Leesville with Reverends John Kautz and Craig Forque officiating. Burial will follow in Leesville Cemetery under the direction of Jeane’s Funeral Service. A visitation time for the family and friends of Mr. Haymon will be held fro 5:00 p.m. to 9:00 p.m. on Friday, January 25th at the church. Mr. Haymon was born on January 14, 1933, and passed away on January 23, 2019, at the age of 86. 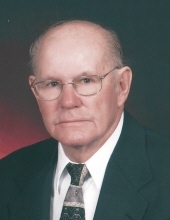 He was a soldier in the Army and served in the Korean War as well as being a founding owner of Haymon Construction and a long-time building contractor in Vernon Parish. For 50 years, Mr. Haymon was a Mason and a member of Masonic Lodge #165 in Lake Charles. He was a supporter of Wampus Cat football and a faithful member of First Baptist Church of Leesville. Mr. Haymon had a giving heart and helped many people. His family was the most important part of his life, and he worked hard to be a good provider for them. Preceding Mr. Haymon in death were his parents, Dock Delmore Haymon and Edith Cryer Haymon; grandson, Christopher Haymon; and brother, O.W. Haymon. grandchildren, Jeremy Brett Haymon; Jennifer Schoeppner and husband Devin; Leina West and husband Jason; Samantha Marker and husband Kyle; Charlene Plate; and Winston Bynog. and a host of extended family. Pallbearers will be Gene Haymon, Morgan West, Danny Gilcrease, Terry Haymon, Brett Haymon, Jason West, and Mark Pollard. Words of comfort and encouragement for the family of Mr. Haymon may be left at www.jeanesfs.com. To send flowers or a remembrance gift to the family of Wallace Wayne Haymon, please visit our Tribute Store. "Email Address" would like to share the life celebration of Wallace Wayne Haymon. Click on the "link" to go to share a favorite memory or leave a condolence message for the family.